Alison Evans-Fragale was dumbfounded when she got a call from Lonely Grey Rescue bird sanctuary to say that PSE&G had dropped off 27 baby parrots who had been living in nests removed from utility poles in Englewood, NJ. Six of the babies were dead. For the past decade Evans-Fragale, a nurse practitioner and founder of the Edgewater Parrots Society, a group that works to protect the birds, has had an amicable relationship with the power company. She said that she was always alerted before a nest teardown either in her town or in neighboring communities so that she could be on site to monitor the removal and safe handling of any babies. While most local residents enjoy having these exotic birds in their backyards, the parrots clash with the power company because they build their nests on utility poles. Utility companies say that the nests can cause fires and power outages and for years have sought ways to co-exist with the parrots. Some companies felt that euthanizing the birds was the best option but that led to outrage from animal welfare groups. In Florida, specially designed alternative platforms have proven successful in luring the parrots away from electrical power infrastructures. In Texas, utility workers trim back nests without destroying them. And in Britain where many wild parrots now live, new techniques have been developed to insulate utility wires that stop the short circuits or voltage drops caused by the nesting birds. In Edgewater, PSE&G agreed not to remove nests during the breeding season, which is around the end of April to the end of September, unless in the case of an emergency. A town ordinance further protect the birds by requiring that a wildlife specialist or bird advocate be on site to ensure the proper removal of the nests and the protection of any babies. When nests are removed during breeding season Evans-Fragale said it’s extremely important that a wildlife specialist is on hand to take over the care of the babies once they are removed from the nests. This involves placing them in incubators and feeding them every two hours at the site until they are safely transported to the bird sanctuary. Because the parrots rebuild their nests on the poles within two weeks of nest destruction, the Edgewater Parrots Society and the power company have sought ways to deter them away from the poles. Orange insulating sleeves for example helped stop some of the rebuilding because the parrots don’t like that color. Members of the society also enlisted the help of local residents in building nesting platforms to lure the birds to safer homes. Evans-Fragale said parrot advocates are limited in what they can do to help the birds as long as they remain on the NJ Division of Fish and Wildlife’s Potentially Dangerous Species List. “Being on this list means humane treatment of the birds is not insured and they can be indiscriminately killed,” she said. The parrots were placed on the list when they first became prevalent in the 70s, and the government feared they posed a threat to agriculture and to native species. To date, there has been no documentation of either of these fears being warranted and studieshave shown that they do not pose a threat. 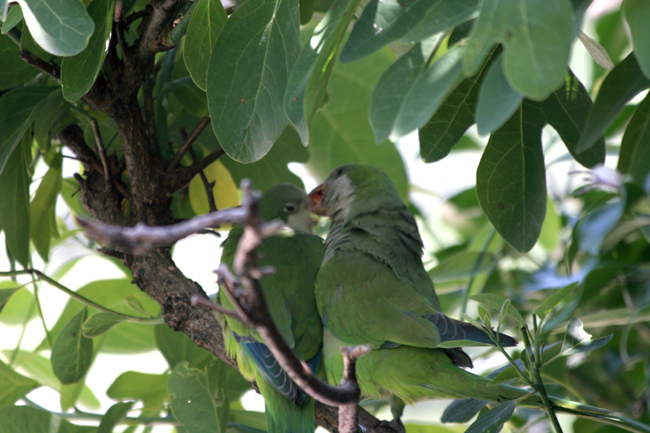 In fact, the Edgewater parrots live peacefully with other species of birds, even sharing their nests with some. As for food? They forage on the ground and are big fans of clover and cherry blossoms. During the winter months, they often turn to the kindness of humans for some of their meals. “It’s been more than 45 years and the Division of Fish and Wildlife needs to make a decision. Either the birds are dangerous – and there’s no evidence to substantiate that – or they come off the list,” Evans-Fragale said. Reach out to NJ Assemblywoman Valerie Vainieri Huttle who is sponsoring a bill to remove the quaker parrots from the Potentially Dangerous Species list and ask for the bill to be pushed through as quickly as possible. Reach out to PSE&G and ask that they make sure a wildlife specialist is at the site of every nest removal to ensure the humane treatment of the parrots and their babies. 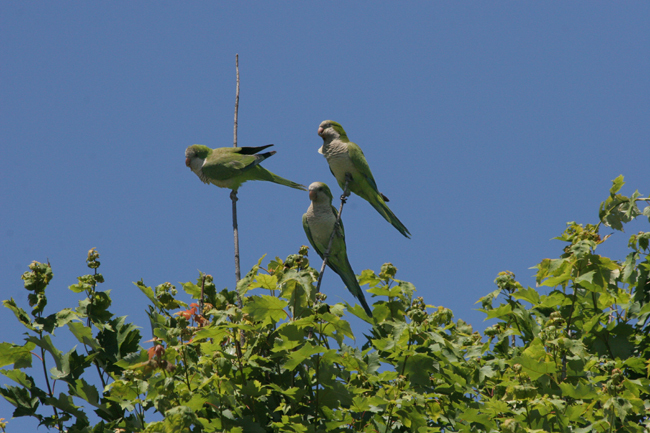 Consider have a nesting platform built on your property if you live where there are quaker parrots. Make a donation to Lonely Grey Rescue to help care for the 21 homeless quaker parrot babies in their care. These babies will need to be adopted into loving homes. If you know someone who lives in a state where it is legal to have a pet quaker parrot, please refer them to Lonely Grey Rescue to fill out an application form. Visit the Save the Wild Quaker Parrots of New Jersey Facebook page for more information on how you can help the parrots. Previous Previous post: Why do Some Dogs Adjust to Babies While Others Get Stressed? Does Your Cat Have What it Takes to do Therapy Work?